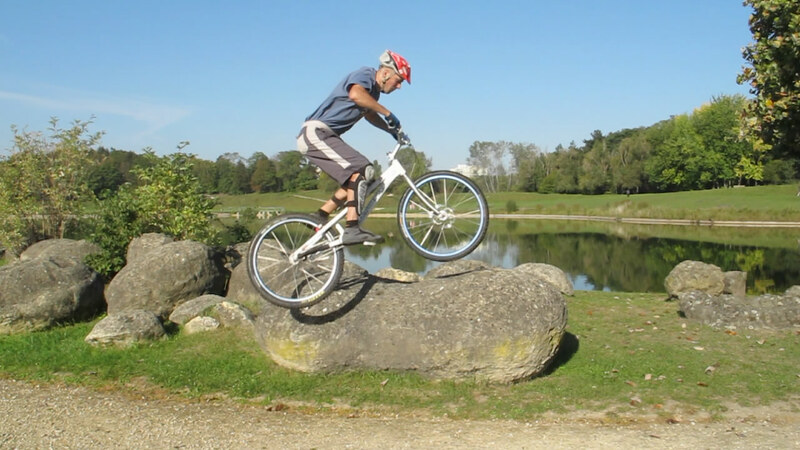 The side hop is a powerful mix of a pedal kick optimised for height and a bunny hop to tuck. It combines the body language of both techniques with extra momentum sideways so that you land on the obstacle next to you. Nicolas Agyemang pulls his bike up to land on top. There are plenty of variations and subtleties around the side hop, but learning the "plain vanilla" version with both wheels on the ground will help you understand all the basics. What's more, starting with both wheels on the ground, you don't have to struggle on the rear wheel, it is somehow easier on muddy terrain, and you can take advantage of both wheels to push-up on the ground before take-off. Start from a trackstand position with the obstacle on your lazy foot side. Both brakes locked, crouch on the bike to compress both tyres while pre-loading your front pedal. You should end up with your arms stretched, your bum over the rear wheel ready to kick into your front pedal for a full jump extention. At full compression, release the brakes and spring up into a full jump impulse. Keeping your arms stretched, pull the handlebars to your abdomen as you push on your front pedal in acceleration. 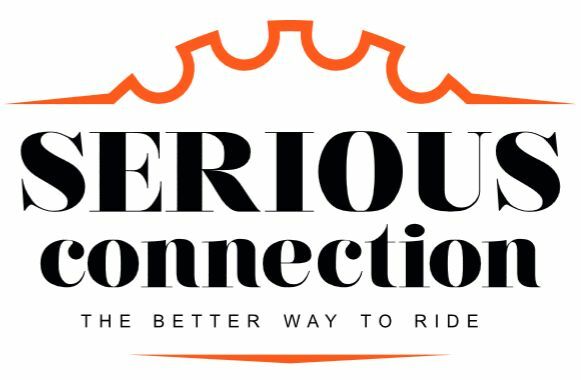 This will not only lift the front wheel up as you push down on the pedal, but it will also thrust your body up, leveraging the whole bike as a powerful cantilever (between the bottom bracket and the handlebars) to catapult yourself. This cantilever effect actually lifts you up as you pull on the bars (you are standing on a moving platform with upward thrust). Crouch to compress both tyres before you jump. 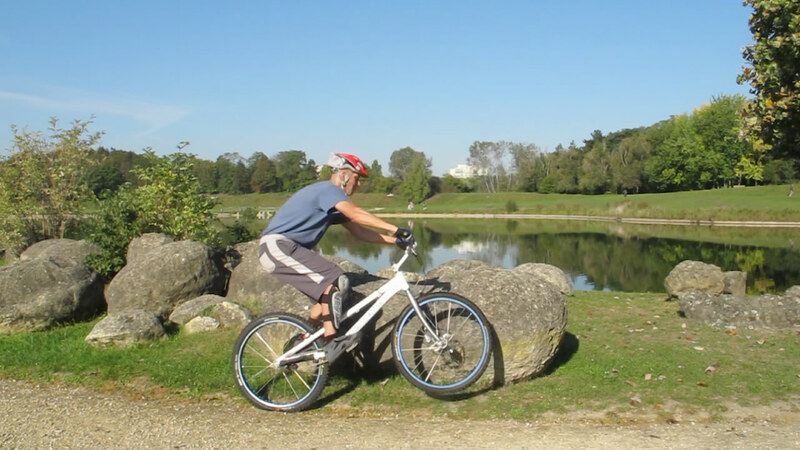 As you move up on your front pedal to give a firm pedal kick, carry on with your extension, straighten both your arms and legs to concentrate the jump impulse on the rear tyre. Keep pushing on the ground during the full jump impulse but skew your impulse sideways by leaning your shoulders slightly over the obstacle, away from your strong foot. You are ready to take-off when the bars are to your abdomen, arms fully stretched after a full extension standing on the rear wheel. Tuck your knees up to follow up on your vertical momentum, lifting the bike up with you. Like in a bunny hop, you will end up fully tucked in mid-air. You can level up the bike by pushing the handlebars forward. This will help you to lift the rear wheel further as you maintain the tucked position. 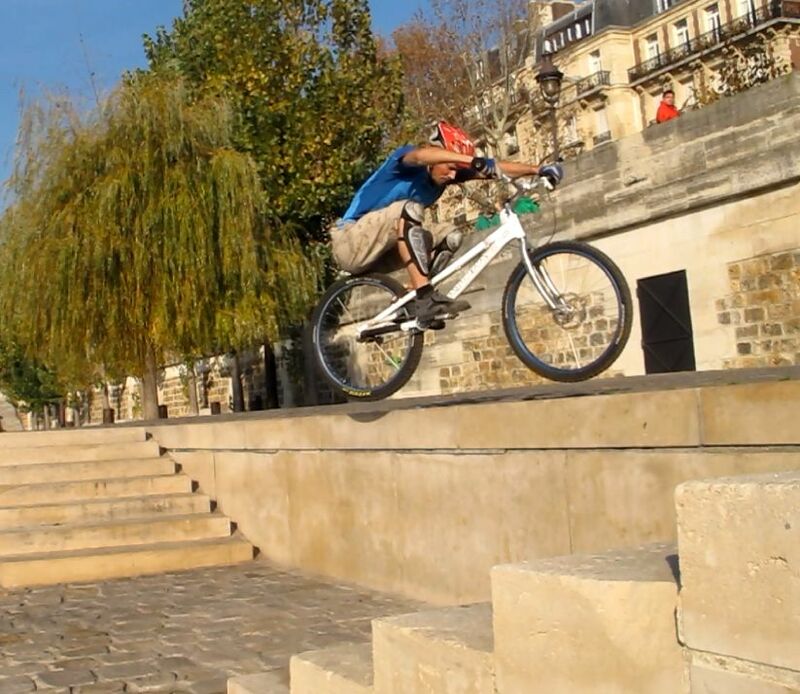 Apply pedal back-force to re-adjust the bike beneath you and over the step you want to side hop. Gravity takes over very quickly, land both wheels locked to secure a good grip on the obstacle, resist the temptation of putting your lazy foot down, keep your feet on the pedals and find your balance. 2° At full compression, release the brakes and spring up into a full jump impulse. Pull the handlebars to your abdomen to lift the front wheel up as you push on your front pedal. 3° Carry on with a firm extension, straighten both your arms and legs to concentrate the jump impulse on the rear tyre. 4° Tuck your knees up to follow up on your vertical momentum and firm up your arms to lift the bike up with you. 5° You end up fully tucked in mid-air. You can level up the bike by pushing the handlebars forward. This will lift the rear wheel further up. 6° Gravity takes over very quickly, land both wheels locked to secure a good grip on the obstacle. Tucking flat out to level the bike up. To hop sideways, lean your shoulders slightly over the obstacle during take-off to skew the whole impulse towards the step. 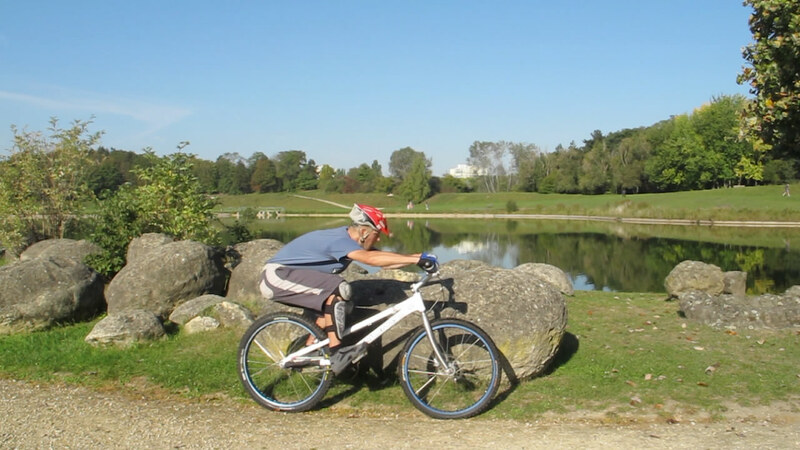 The bike follows naturally when you pull it up and you can easily re-adjust it with your shoulders so it lands parallel to your initial position on the ground. At the beginning, it is quite common to fall back sideways, because your centre of gravity may be off-balance from the edge you are trying to reach. Briefly check the spot on which you want to land, but really focus on compression and take-off. 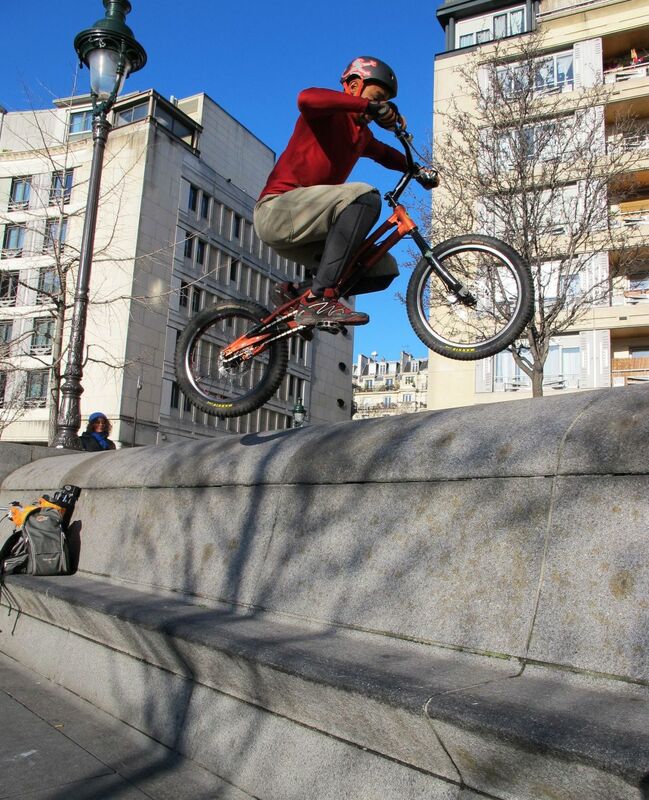 Landing is less of an issue when you start with fairly wide obstacles and you can always adjust the bike beneath you. Start on any street kerb and build up your skills from there. Work out your jump impulses to be as explosive as possible, very much like for a squat jump. Plyometric workouts are one way to improve the speed and elasticity of your muscles, improving on contraction explosiveness. Big bouncy tyres at low pressure do help to be smooth.